You are a human being. These two words not only describe who you are as a member of a particular species but, if examined more deeply, also point to the twofold nature of your identity. Human is who you are on the level of form; that is to say, your body and mind. Those two aspects of your form identity make up your conditioned self. That self is conditioned by genetics and the environment, as well as other factors as yet unknown to science. Being, on the other hand, points to the essence of who you are as timeless, formless, and unconditioned consciousness. Human and being, form and essence, are ultimately not separate, in the same way that a wave or ripple on the surface of the ocean is not separate from the ocean or from any other wave or ripple, although it may appear to be so. Being, or pure consciousness, emanates from the Universal Source of all life – God – as light emanates from the sun. Unlike the sun, however, the Source does not exist in space and time. It is unmanifested and therefore inconceivable, so there is nothing you can say about it. However, your consciousness emanates from the Source, so you can never be separate from it, just as a ray of sunlight cannot be separate from the sun but always remains connected with it. The Source emanation pervades the entire cosmos – which is to say, our dimension of space and time – and it is the intelligence underlying and guiding the evolution of what we perceive as the physical universe. So the universe, including human beings, was not just created in the distant past but is still in the process of being created. It’s a work in progress, so to speak. You need to understand this basic premise to be able to appreciate and derive great benefit from reading this book. As Steve Taylor puts it, evolution is not just behind us, but in front of us as well. Furthermore, and contrary to the creed of our mainstream culture, there is direction and purpose behind the evolutionary process, as he explains in this book. Where it is going, however, is beyond all imagination. What we can say is that the evolutionary impulse behind the process is the growth of consciousness. The universe wants to become more conscious, and the main life purpose for all human beings, is to come into alignment with that universal purpose. Seen from a higher perspective, of course, all that exists is already in alignment with it, even if it seems to be opposed to that purpose, but it is aligned only unconsciously. Entering into conscious alignment with the universal purpose is an amazing evolutionary leap. Although this book provides plentiful conceptual clarification regarding wakefulness, as well as many highly interesting firsthand accounts by people who have experienced that shift in consciousness, you cannot truly understand the meaning of awakening except through awakening, which means going beyond discursive thinking and concepts. The concepts, however, can be helpful if used rightly, as pointers toward realization rather than as ultimate explanations or mental constructs that you need to believe in. In any case, this book will be of real benefit to readers who are either already undergoing the awakening process or who have reached a point of readiness, perhaps as a result of experiencing a deep crisis, a loss, or some kind of psychological turmoil in their lives. This book can greatly assist those readers in understanding what is happening to them and coping with the confusion or disorientation that often accompanies the initial stages of that shift in consciousness. Others may discover that they have already had awakening experiences without realizing it or that they have been going through a gradual awakening for some time without recognizing it for what it is. Life always gives you what you need, and right now it has given you this book to use as a guide or companion through challenging times. 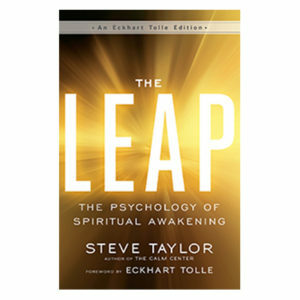 It contains a great deal of precious wisdom, expressed in the straightforward, clear, and down–to-earth language that Steve Taylor is so good at. I have a feeling that by way of a miracle, it may even reach one or two people in the media and in politics!